A slice of history, the Albright Visitor Center in Mammoth Hot Springs has been servicing visitors since 1909. Now, with its recent remodeling complete, the Center is even more ready to cater to visitors. Several important changes were made to the Visitor Center. Firstly, the second floor was closed, shifting exhibits down to the first floor and basement. Next, new exhibits were created that mirrored and expanded upon the old ones: documenting Yellowstone’s history, both human and natural. Finally, new bathroom facilities were created. An elevator is available for visitors to access the downstairs area. Primarily, the Visitor Center educates visitors, but also serves as the Mammoth Hot Springs backcountry office. Here, visitors can pick up permits to go backcountry camping. They can also pick up boating and fishing permits. Walking up the Albright steps takes you into a bright, revamped space appealing to the eye. 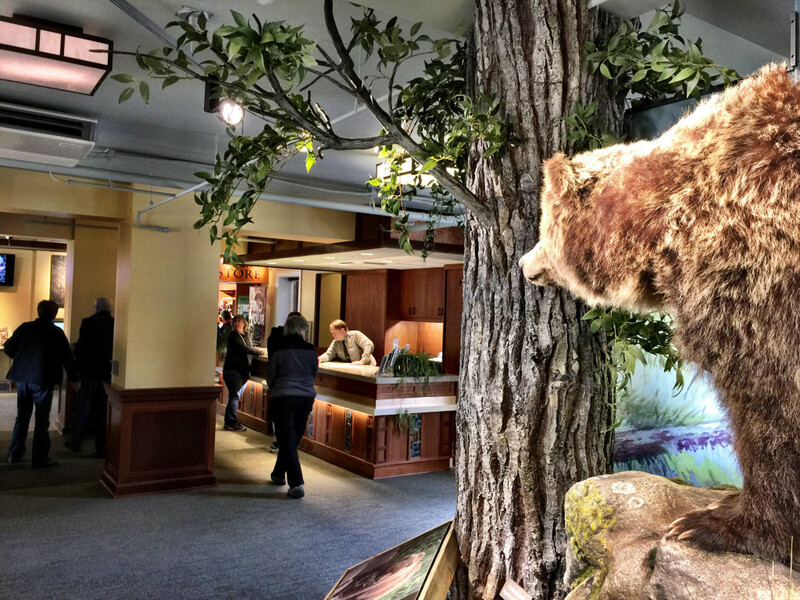 The first floor is mainly dedicated to natural history exhibits and the Yellowstone Association bookstore. Animals of all walks are on parade: elk, mountain lions, wolves, otters, and a grizzly bear, among others. Be sure and bring the kids around. One corner of the first floor is also devoted to teaching visitors about hydrothermal features. Downstairs focuses on Yellowstone’s history from discovery to the present day. Spick and span display cases show off various artifacts from the Park’s history; highlights include military items, old camping ware, and even one of Thomas Moran’s sketchbooks. Besides these items, the downstairs also has an interactive photo wall, with sliding panels. In addition, the exhibit documents some of the struggles officials and appreciators have undergone to preserve bison, thermal features, and other facets of Yellowstone’s history. Albright is, of course, a relic of this history. The building is one of many built as a part of Fort Yellowstone, when the United States Army managed the Park between 1883 and 1916, before the creation of the National Park Service. Specifically, it quartered the single officers. With the NPS Centennial coming up, Albright has received the right update, in time for the next chapter of Yellowstone National Park history. Although the Center is currently open, Albright will be having an opening event July 12 at 10 a.m. Even if you won’t be in the area then, make a plan to stop by the Visitor Center. Their summer hours (May 23-Sept. 30) run 8 a.m. to 7 p.m.